Biography: SfCommand has been designing sites since 1997. He is interested in XHTML CSS and PHP. After setting up an account at ZoneEdit.com, when you log in, you are presented with a screen similar to this. From here, if you haven't already, you can set up a new zone. 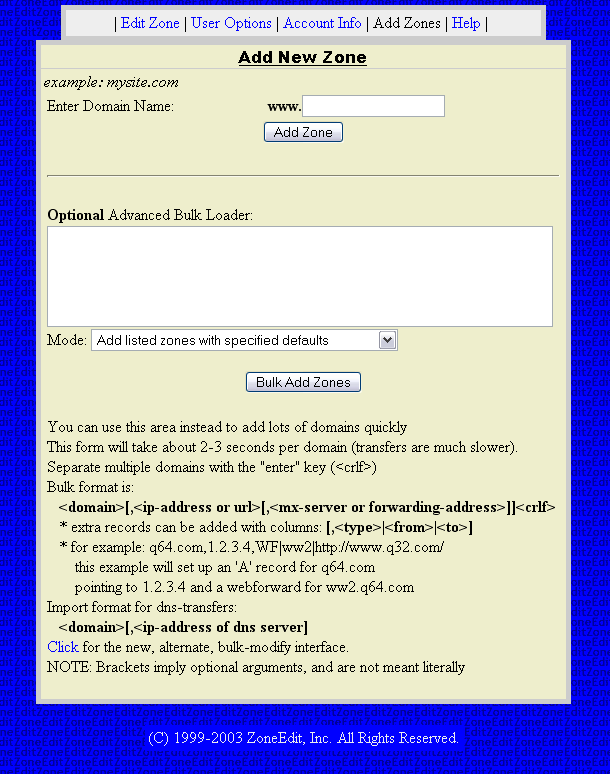 A zone is a collection of DNS records for a given domain. (If you have already added the zone, then you can skip down to the editing part of the tutorial). Ignore everything in the "Optional Advanced Bulk Loader" section. 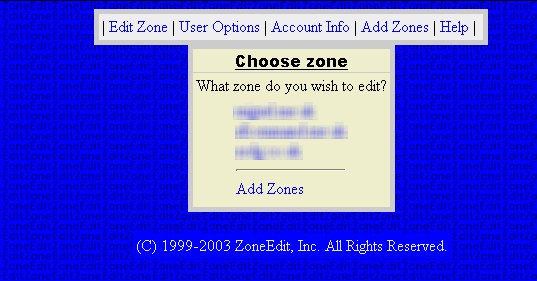 Simply type the domain you want to use with zoneedit, and press the "Add Zone" button. You will then see a page similar to this. You will then need to update the nameservers for your domain to those specified near the top of the page. You will need to contact your domain registrar and ask them to update the nameservers for you, or use their control panel if they offer one. You can however set everything up ready so that once the changes have propagated, your domain will be ready. You will need to add several A records (records which point a domain or subdomain to a given IP), so that your domain will work as it did before. Click the "IP Addresses" link, and you will get a page similar to this one. To obtain the numeric IP for your server/account, either use your operating system's "ping" program, or contact you web host. Click yes, you want both domain.com and www.domain.com to have that IP. Continue adding the records, until you have added all the required ones. For each record added, you will be asked if you are sure you want it to have that IP, answer yes every time. You now need to enter an MX record, which will handle email for your domain. Click the "Mail Server (MX)" link. You can use the "IP addresses (A)" section to point a subdomain of your site to another server (ie: your own computer if you have a broadband Internet connection). You can add subdomains which point to the same IP as you used above. 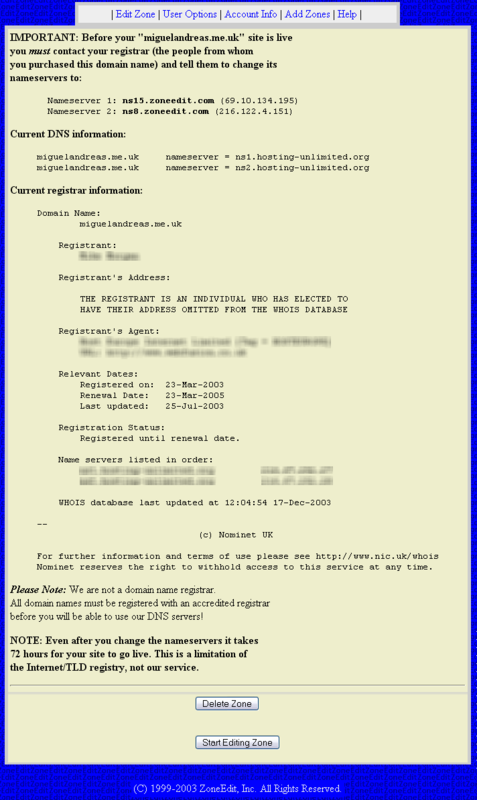 Follow the same instructions as for adding the "ftp" or "mail" A records. You can use ZoneEdit's "WebForward" feature. "New Domain" refers to the subdomain you wish to have (ie: "forums"), and "Destination" is where it forwards to (ie: "http://www.yourdomain.com/forums/"). "Cloaked" means that subdomain.yourdomain.com will remain in the browser address bar, whatever page your visitors are on (so they won't see "http://www.yourdomain.com/forums/a_page.php", for example). 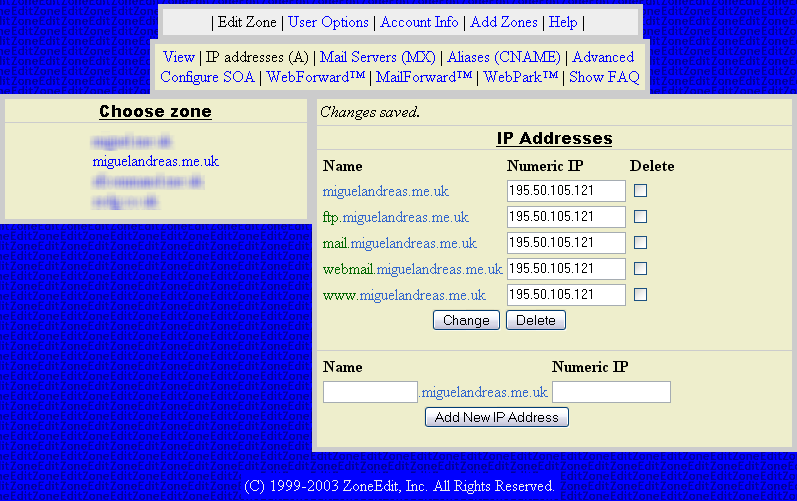 If you have a dynamic IP (ie: you are on a dialup Internet connection or your ISP does not offer a static IP), then you can use ZoneEdit in conjunction with a service such as no-ip.com or dyndns.org. When you have a working address in the form username.dyndns.org or username.no-ip.com, click the "Aliases (CNAME)" link. "Alias" is the subdomain you want to have (ie "home" or "mypc"), and the "Actual Name" is the dyndns.com/no-ip.com (or whatever service you use) name (ie yourname.dyndns.org). I just signed up for zoneedit. I did not get a single page that looked like that. I allso never got zoneedit to work. Had to change my dns back to my domain registerer. Maybe you could update this info since I would really like to use zoneedit? this ZoneEdit page for registration only pops up when i go to one website. the one that i use everyday for my business. but nowhere else. why? i close it and i can't do any work. how did it get on my pc? i have been using ZoneEdit for years and never had a reason to complain until the last couple of weeks .. when both the site and the DNS servers seem to be intermittently unavailable. when it goes down neither does my domain resolve nor is the base zoneedit.com accessible. is there anyone else who is facing this problem? is there someone giving information about this .. I was trying to run Apache on my own server box on my broadband cable connection. I forwarded the URL to my IP:8080 as my ISP blocks port 80 and this works fine if hosting only one website. But Apache cannot resolve different domain names using DNS forwarding. I had to enter an "A" record to get multiple domains on one IP to work - BUT you cannot use a non standard port - it simply won't allow you to enter a port number. I just blogged about failover using ZoneEdit. See <a href="http://barnabyfry.wordpress.com/2007/03/22/poor-mans-failover/" target="_blank">Poor mans failover</a>. I had some downtime with ZoneEdit (both nameservers) so now I use two different nameservers. Thomas: I have answered your question on the forums. Does the email forwarding with Zone Edit require the name servers to be at Zone Edit, or is it sufficient if only the MX-records point to their servers? (I am asking because I would prefer the name servers to be with my web host). I have been using zonedit for a long time and love it. I DO have one problem, and I can't resolve it. I have 2 machines and a router. I can configure the router so for example port 9090 comes to one of my ervers. anyone can access it from outside my LAN, but neither of my 2 sorkstations can. I am right now with verizon DSL. Does anyone know if ZoneEdit supports pointing any subdomain a user enters to the same IP, like *.domain.com => IP? So even if the user enters adsfasdfa.domain.com he will still be sent to the IP instead of getting a "domain not found" error? Please send me a mail if you know.. But changed the default port 21 to port 28 in my serv-u program. So do I need to do any forwarding or any modification in the ZoneEdit ? Does it allow the usere to create subdomains within a existing website, using the name 'subdomain.yourwebsite.com'? For that matter can you completely mask the name.that is, can you create a simple name for all that stuff, like anyname.com/?/arc...? Once the subdomain is created then is it correct to say we must add an HTML or other page to make that subdomain viable? RocketGeek: It's working fine here right now. ZoneEdit has been down for the last two days, anybody else seeing this? Rik: It's working fine here. Where is Zone Edit? Has it closed down? This is an excellent example! I always wanted to make the same tutorial, but now, i dont need to anymore! ZoneEdit.com is the best. I use it for all my domains and it's never missed a beat. Can you believe it's free? I still cant! Excellent tutorial, I'm just about to play around with ZoneEdit myself so you've just made life that little bit easier, cheers.